Description: NO MAGAZINE SALES into NEW YORK CITY. CONNECTICUT residents must furnish us a copy of your CT Eligibility Permit or ammunition certificate. This listing is for ONE magazine. Here is the replacement factory magazine in 10 round, California Compliant configuration for the Sig Arms 2340 Pro or the Model 2022 chambered in .40 S&W, or, for that matter, the .357 Sig caliber as well. 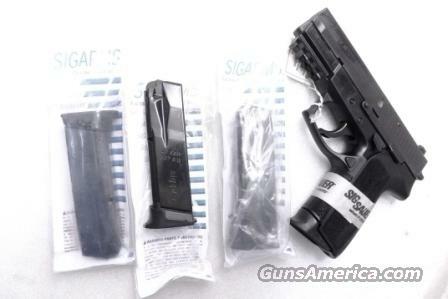 Manufacturer is Mec-Gar of Italy, Sig’s primary contractor for its factory magazines; and each is Sig marked. Construction is smooth finish blue steel body with milled back; spring is steel; cartridge follower and floorplate are high impact black polymer. Each magazine holds 10 rounds of .357 Sig caliber or .40 S&W caliber ammunition. These magazines will not fit other models of Sig pistols than those two variants. They will not fit a Sig 229, Will Not Fit a Sig 250, will not fit the boom stick of a Case 580 Backhoe. They will only fit Sig Arms model 2022 or 2340 chambered in .357 Sig or .40 S&W calibers. Anyone who does not know the difference between a .357 Sig and a .357 Magnum probably doesn’t own a semi automatic pistol and doesn’t need one of these. These are New Factory Sig Magazines still in their oil and wrap, and most of them are individually packaged like the ones in the photos. Own 1	for only	$49.00. Not for sale to residents of New York City. Any magazine deliveries into New York City require written permission of the Police Commissioner, so we cannot ship magazines into any of the six boroughs or 176 some odd zip codes, per NYC Code 10-131.10. Civilian residents of New York State are legally enjoined from loading more than 7 rounds into any magazine.